At the tender age of nineteen, Donahue Peebles entered the business jungle with no resources beyond his native smarts, a decent education, and a powerful drive to succeed. Seven years later he became a multimillionaire. Today, with a net worth of more than a quarter-billion dollars, he commands a real estate empire stretching from the boulevards of Washington, D.C., to the sparkling beaches of Miami Beach to the glitzy strips of Las Vegas. How did this determined young entrepreneur achieve such spectacular success so quickly? Can others learn his secrets and emulate his accomplishments? Can you? Part The Art of the Deal and part Why Should White Guys Have All the Fun, The Peebles Principles distills the lessons Mr. Peebles has learned on his journey from congressional page to CEO of the largest Black-owned real estate development firm in the nation. These crisp, straightforward principles can help any motivated entrepreneur go from dirt poor to filthy rich in a hurry. In entertaining first-person accounts of his most important deals, Mr. Peebles reveals how each transaction required him to find new resources within himself to ensure its success. Through this process, he discovered valuable principles that would aid him in all of his future endeavors. Some lessons are motivational and inspirational; many are hardball business how-to's that apply in any industry and any type of transaction. Colorful and detailed behind-the-scenes accounts of each transaction provide a real-world business context for each principle and show you how to apply them in practice. 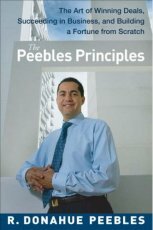 Complete with a unique discussion of the importance of politics in business and how to make it work in your favor, The Peebles Principles is the indispensable resource for anyone eager to turn dreams of business success into reality very, very fast.